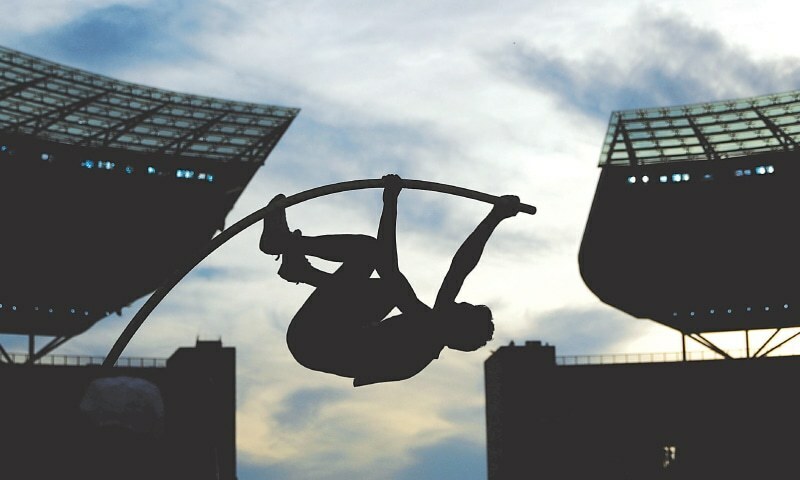 BERLIN: Pole vaulter Armand Duplantis claimed Sweden’s first gold of the European championship in fine style on Sunday, the teenager soaring to a world junior record of 6.05 metres as Briton’s Dina Asher-Smith bagged her third gold. Aged just 18 years and 275 days, Duplantis is the youngest athlete to win a field event at the Euros, and follows in the footsteps of 17-year-old Norwegian Jakob Ingebrigtsen’s double gold showing in the 1500 and 5000m. At a packed Olympic Stadium, Duplantis became just the 22nd man to go over the mythical six-metre barrier, and the youngest ever, as he set an 11th junior record in his remarkable, fledgling career. Timur Morgunov, the Russian competing under a neutral flag as his country remains banned because of a state-sponsored doping programme, took silver with a vault of 6.00m, while France’s world record holder and three-time European champion Renaud Lavillenie claimed bronze (5.95). Duplantis’ mark of 6.05m matches Lavillenie’s best outdoors, with only Ukraine great Sergey Bubka having gone higher in a stadium. On the track, Asher-Smith produced a fantastic anchor leg in the women’s 4x100m relay to seal a unprecedented third European sprint gold for Britain— the first 100/200 4x100m relay treble since German Katrin Krabbe in 1990. Having already won the 100 and 200m titles, Asher-Smith took the baton in fourth place after conservative handovers between Asha Philip, Imani Lansiquot and Bianca Williams. But Asher-Smith showed all her form to power past the opposition, offering up a clinical finish for a third gold. Stand-in Harry Aikines-Aryeetey held off 200m champion Ramil Guliyev of Turkey to hand Britain gold in the men’s 4x100m relay, meaning a second championship gold for 100m champion Zharnel Hughes. Two-time world bronze medallist Sifan Hassan of the Netherlands smashed the championship record for the women’s 5000m, the Ethiopian-born runner timing 14:46.12, with Britain’s Eilish McColgan claiming silver, almost 7sec off the pace. Kenya-born Turk Yasemin Can took bronze (14:57.63), but there could easily have been another Kenyan-born runner on the podium had Lonah Chemtai Salpeter, now competing for Israel, not pulled up a lap short thinking the race was over. With five throws that would have won the competition, Poland’s Anita Wlodarczyk, arguably the best women’s hammer thrower of all time, completely dominated the discipline for her fourth successive title. The world record holder, who is the double defending Olympic champion and a three-time world gold medallist, threw a championship record of 78.94m, more than four metres better than France’s Alexandra Tavernier in silver. Poland’s fine field medal showing continued with Joanna Fiodorow taking bronze (74.00). Berlin’s packed Olympic Stadium was gifted a home gold medal when Gesa-Felicitas Krause defended her 3000m steeplechase title. A fast first mile split the field, but Krause, who fell in the London worlds last year, thrived on the crowd’s energy to clock a winning 9:19.80. Switzerland’s Fabienne Schlumf took silver in 9:22.29, with Norway’s Karoline Groevdal claiming bronze (9:24.46). Scottish vet Laura Muir improved on her world indoor silver by winning the women’s 1500m in 4:02.32 ahead of Poland’s Sofia Ennaoui in 4:03.08, with another Briton, Laura Weightman, taking bronze (4:03.75). Portuguese veteran Nelson Evora left it late for gold in the men’s triple jump, going out to 17.10m on his fifth of six attempts. The 34-year-old Ivorian-born athlete, who initially competed for Cape Verde and was 2008 Olympic champion and 2007 world gold medallist, had enough to beat out Cuban-born Azeri Alexis Copello (16.93). Meanwhile in Glasgow triple gold medallist Artur Dalaloyan proved the standout men’s gymnast, adding two individual apparatus triumphs on Sunday 24 hours after leading Russia to the team title. Dalaloyan, the 22 year old European all-around silver medallist last year, took gold in both the vault and the parallel bars as well as bronze in the floor exercises at the SSE Hydro Arena. Dalaloyan had been spurred to do better, he said, by a mistake that he had made on the floor. That error had helped give Britain’s Dominick Cunningham the chance to strike gold in that event, a particular delight for the 23-year-old after he had ended the team event on a crushing low. Cunningham had slipped off the horizontal bar twice with Britain locked in battle for the gold on Saturday, a calamitous routine that helped open the door for the Russian gold. Cunningham’s victory helped make up for the home crowd’s disappointment at seeing a sub-par performance from Max Whitlock, with the Olympic champion only finishing seventh in his signature pommel horse event. Instead, victory went to 19-year-old Rhys McClenaghan, who could celebrate the first-ever European gymnastics medal for Ireland. The teenager who also beat Whitlock on the pommel horse when competing for Northern Ireland in this year’s Commonwealth Games, still scored 15.300 to Whitlock’s 14.0. Eleftherios Petrounias, Greece’s Olympic champion on the rings, was again in a class of his own in that discipline, winning with 15.466, the highest mark of the day on any of the six pieces of apparatus. Switzerland’s Oliver Hegi, silver medallist last year, graduated to gold in the horizontal bar with a 14.700 score.